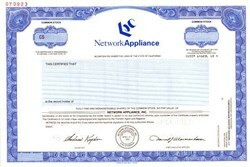 Beautifully engraved SPECIMEN certificate from Network Appliance, Inc. This historic document was printed by the American Bank Note Company and has an ornate border around it with a vignette of the company logo. 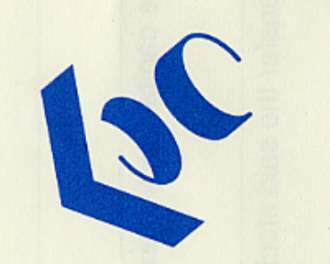 This item has the printed signatures of the Company's Chief Executive Officer and Secretary. Certificate Vignette Network Appliance, Inc. is a world leader in unified storage solutions for today's data-intensive enterprise. Since its inception in 1992, Network Appliance has pioneered technology, product, and partner firsts that continue to drive the evolution of storage. NetApp� storage solutions include specialized hardware, software, and services, providing seamless storage management for open network environments. Major corporations and service providers, including Citicorp Securities, Lockheed, Merrill Lynch, Oracle, Texas Instruments, and Yahoo!, utilize NetApp global data management solutions.